There have been high hopes for ‘Tomorrowland: A World Beyond’ ever since it was announced a few years ago, with the secretive project keeping the premise under wraps and barely releasing an outline until recently. Based on the Disney theme park, the film was announced to star George Clooney and to be directed by Brad Bird, who had handled some of Tom Cruise’s high wire stunts with aplomb in ‘Mission Impossible: Ghost Protocol’ after a career in animation (most notably with Pixar). The origins of the film come in the history of Disney, and particularly in the optimistic young Walt Disney, who created a world of imagination and wonder that dazzled kids and adults alike across cinema screens and theme parks. Unfortunately, the end product is let down by an uneven script and a fairly generic ‘save the world’ plot with nothing special to enliven the journey. The film begins by introducing us to our two key characters: Frank Walker (Clooney), a worn out inventor, with flashbacks revealing the optimistic youngster he once was, and Casey Newton (Britt Robertson), an enthusiastic teenager who stumbles into his orbit after her late night visits to a NASA station. Clooney’s natural charisma doesn’t feel quite on point here, leaving most of the heavy lifting to Robertson who to her credit delivers a charming performance that isn’t served by the script. The film’s opening hour features a heavy degree of exposition and despite a couple of sequences that showcase the special effects and technical wizardry on show, this mostly leaves the film feeling bogged down before the narrative can really kick into gear. Rounding out the main cast are Hugh Laurie as David Nix, the leader of Tomorrowland and a promising figure that isn’t given nearly enough time to flesh out his motives, and an energetic young girl called Athena (Raffey Cassidy). It is rare in modern science fiction for a film to take an optimistic view on the future, and Bird does a solid job in creating a sense of wonder in the opening stages, with the first glimpses of Tomorrowland exciting and fresh as seen through the eyes of a young Frank Walker. The initial set up of the film promises something wondrous to unfold, but the answers feel a little too straightforward when they come, too obvious and unimaginative and they go against the very fabric of the film’s premise. The film hints at being something magical and memorable through the spectacle and the classic music, but the answers are a little too simple and seem like they were rushed to reach the filmmakers desired conclusion. ‘Tomorrowland: A World Beyond’ is a film made with such glee and invention that it feels harsh to write it off entirely, but it’s disappointing that the script fails to match the undoubted energy that went into crafting the world and its effects. 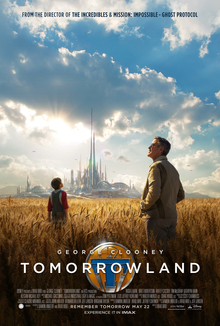 There’s passion behind Brad Bird’s work here, but ultimately ‘Tomorrowland’ falls flat and it’s not a particularly good, or a particularly memorable movie.